When one hundred sailors of King George III's Royal Navy are mysteriously killed on a ship in Boston Harbor, Ethan is thrust into dire peril. 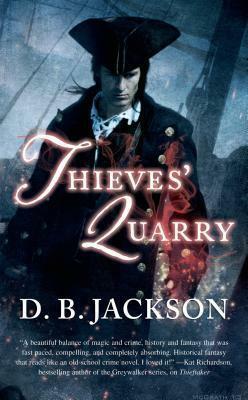 For he--and not Boston's premier thieftaker, Sephira Pryce--is asked to find the truth behind their deaths. City Sheriff Edmund Greenleaf suspects conjuring was used in the dastardly crime, and even Pryce knows that Ethan is better equipped to contend with matters of what most of Boston considers dark arts. But even Ethan is daunted by magic powerful enough to fell so many in a single stroke. When he starts to investigate, he realizes that the mass murderer will stop at nothing to evade capture. And making his task more difficult is the British fleet's occupation of the city after the colonials' violent protests after the seizure of John Hancock's ship. Kaille will need all his own magic, street smarts, and a bit of luck to keep this Boston massacre from giving the hotheads of Colonial Boston an excuse for inciting a riot--or worse.